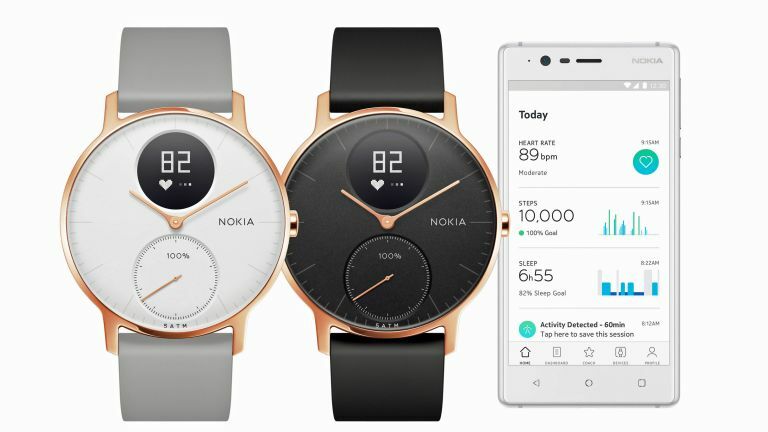 Nokia's Steel HR is, it says, "the first activity tracker with heart rate monitoring to offer a long-lasting battery life of 25 days, all housed in a classic watch style perfect for transitioning from the gym to the office, to a night out." And now it's available in rose gold as well. Of course, the keen-eyed among you will have noticed it's very similar to the Withings Steel HR, which came out last year, but then vanished after Nokia bought the brand out. But now… it's back! What's not up for debate is that since relaunching late last year, the Steel HR has now been joined by the Steel HR rose gold edition. The Steel HR, in any colour, takes the successful template of the Nokia Steel, by counting steps and laps of the pool, estimating distances travelled and calories burned, and also tracking sleep. The steps are shown on the smaller sub-dial at the bottom of the watch. What the Steel HR adds is, obviously, human resources. No, I mean heart-rate tracking, during workouts, showing how fast your heart is racing on the circular, digital display at the top. It'll also track average and resting heart rate when you're not frantically 'crushing your goals'. This data then syncs to Nokia's Health Mate app, where it can be added to stats from your Nokia smart scales, and more. You can set step goals, view trends and, as Nokia puts it, "find expert coaching every step of the way," though I think it's slightly pushing it to call the tips it gives 'expert coaching', personally. There are many many devices that track your pulse from your wrist, but perhaps the real killer selling points of the Steel HR are that it lasts for up to 25 days between charges – although clearly it will last somewhat less than that if you are using it to track workouts daily – and that it actually looks really pleasant, and like a 'proper' watch. The new rose gold edition is equally cool.